Running classroom experiments can be even more problematic for psychology teachers than it is for chemistry and physics teachers. Whilst we do not have to worry about fire and acid, the chances of something going awry in terms of an unexpected result are much higher. Given the difficulty in isolating the many variables of humanity, and the practical and ethical difficulties of pushing people into a test tubes, demonstrating cause and effect can be tricky. We have our old standby of the ‘Stroop effect’, which is based on a reliable, almost physiological effect. I have different but equally reliable experiment, which also makes a powerful point about learning. 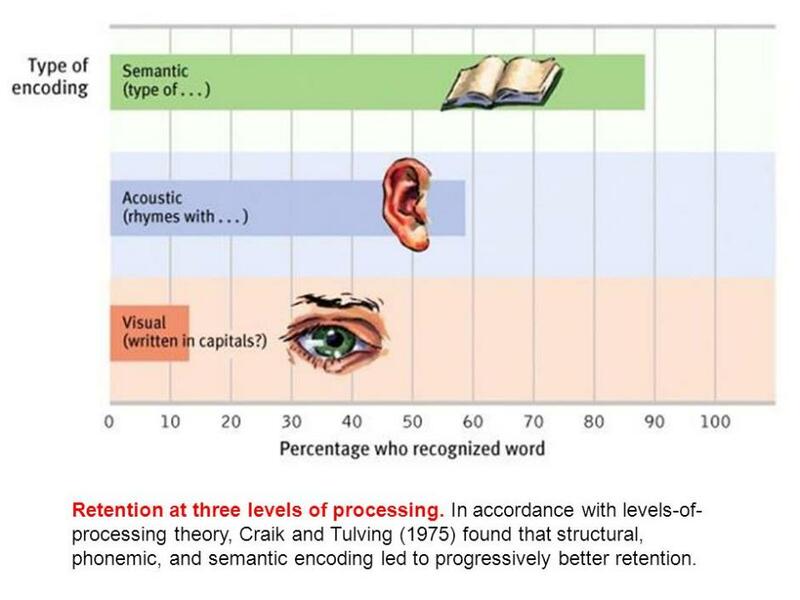 It is based on ‘levels of processing’ (Craik and Lockhart, 1972). One thing I must not do is tell the students what the experiment is about beforehand, but (SPOILER ALERT!) for the purposes of this blog, here comes that explanation. A further control is to emphasise that this is not a test of any individual. Students at this stage of their learning can be extremely competitive. To reduce this as a factor, I disappoint and confuse them by insisting that their answer sheets are anonymous. If I am in a ‘Barnham’ mood I ostentatiously destroy all of the answer sheets, and then hand out another response form. This has list 30 words they were shown, mixed with another 30, randomly dispersed distractor items. (I once made the mistake of telling them this ratio and the scores increased to almost 100%, which is suggests interesting things about the difference between recollection and recognition but completely undermined the purpose of the experiment!) They have to check off words from the previous task, and they only get 2 minutes to do this. When the time is up I again insist that the response sheets remain anonymous. This especially confounds them because they wonder how I could generate comparisons without names. This is an important part of a psychology lesson as it emphasises a particular type of experimental design (‘within subjects’), but it also avoids ethical issues about revealing who did poorly in this task. The results invariably show that the ‘deeper level’ questions, even though they are made easy, correspond to greater recall of the words they relate to. So strong is this effect that in a class of less than 20 students it is unlikely that anyone remembers more of the lower level question-word pairs (I usually lump them together for the sake of simplicity, but the longer version with all three types of question-word combinations the visual and auditory scores fall into line). The relevance of this for Cloze Tasks is that even apparently trivial levels of testing can be effective in increasing recall. When the student has to consider the meanings of words, they have to use thinking at the deepest level. In contrast, for example, a word-search task does not do this: I could get 10 year olds to complete a word search for Latin words, or even random strings of letters (though this would stretch short-term memory). Once the meaning of the word is involved a different level of learning is engaged. 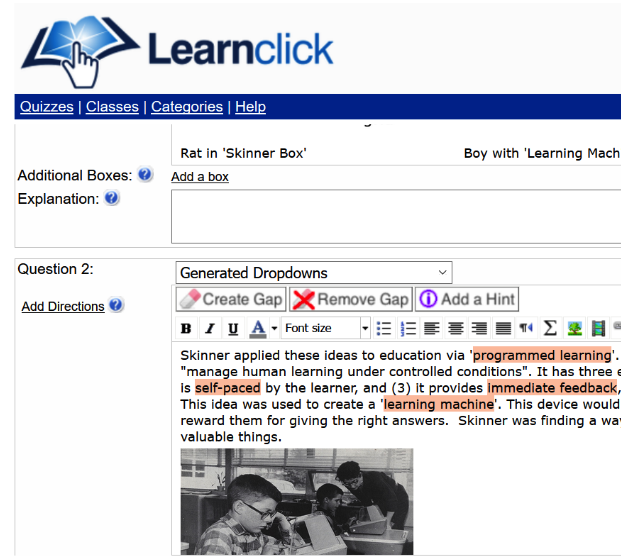 This is one reason why I like the ‘generate dropdowns’ feature for drop-down cues in Learnclick. Even though the correct answer may seem ‘obvious’ (for example when a noun is required and the other choices are adjectives or verbs) the student is exposed to other key terms because since they are automatically selected from elsewhere in the text. This effect may be more powerful for language teaching. For example, if the answer is selected by distinguishing terms through consideration of grammar (e.g. between verbs, connectives, pronouns etc. ), the deep level processing of this aspect of language is going to be effective. I am a big fan of flash cards (which also work well as a web-based task), but Cloze Tasks add a deeper level of processing because they embed the words in a particular context. The context supports the thinking process as alternative solutions are contemplated, creating a virtuous circle of thinking. Furthermore, seeing the words in a full context also exposes the student to models of language use. This is as important for my psychology students (particularly in the context of a local culture that does not emphasise the important of literacy), as it might be for language teachers. I think the rest of the teaching profession has some important lessons to learn from our TEFAL/EAL colleagues, and the benefits of Cloze Tasks for learning (not just for teaching) is one of them! The teacher still has an important task to manage – the level of difficulty needs to strike an important balance between being too easy or too difficult. Easy tasks are demotivating (and possibly even insulting!). Tasks which are too difficult are also demoralising (see ‘Learned Helplessness’ below). The ‘sweet spot’ is not necessarily mid-way between the two. There is evidence of a phenomenon called ‘learned industriousness’ where some degree of failure in the context of success at difficult tasks creates a greater sense of reward and this increased motivation. Motivation is the key to learning. One of my (hyperbolic) homilies is that teaching people who do not want to learn is the worst job I’ve ever had, but teaching people who do want to learn is the best.